Start, Henry R., of Bakersfield, son of Simeon Gould and Mary Sophia (Barnes) Start, was born in Bakersfield, Dec. 28, 1845. He was educated in the common schools and in Bakersfield and Barre academies, and served in the army as a member of Co. A, 3d Regt. Vt. Vols. After the close of the war he studied law, and was admitted to the Franklin county bar in April, 1867, and began practice the same year in Bakersfield. From 1876 to 1878 Mr. Start was state's attorney for Franklin county. Forming a partnership with A. P. Cross, of St. Albans, he retained his residence in Bakersfield, and the firm of Cross & Start had a large practice. The active conduct of the trial of cases largely fell on Mr. Start, and when he was elevated to the bench it was at once noted that his wide experience as a trial lawyer had given him good preparation for the right conduct of trials as presiding judge in the county courts. In 1880 Mr. Start was elected a senator from Franklin county, and served on the judiciary committee and as chairman of the joint standing committee on the reform school. From 1880 to 1888 he was one of the trustees of the Vermont reform school, and was, the last-named year, one of the presidential electors who cast the vote of Vermont for Harrison and Morton. In 1890 he was elected representative from Bakersfield, and at the beginning of the session of that year was chosen speaker of the House of Representatives, and at its close was without opposition elected fifth assistant judge of the Supreme Court. His service on the bench, which he continues by unanimous re-election in 1892, has commended itself to the entire bar of the state as excellent judicial work. 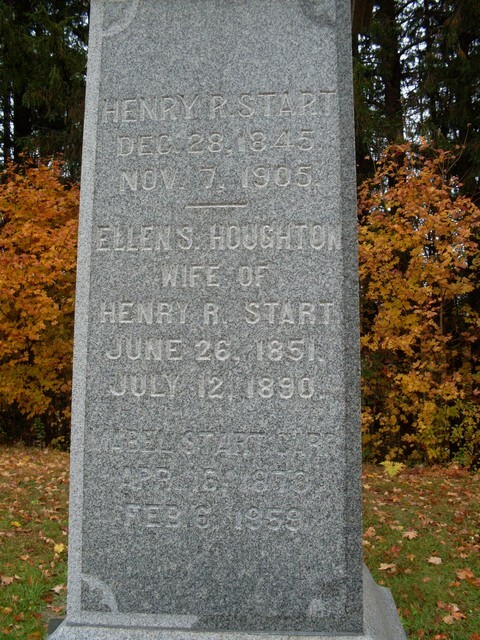 Mr. Start married, June 10, 1869, Ellen S. Houghton, daughter of Stillman S. and Sarah E. Houghton. Their children are: S. Gould, Guy H., Mabel S., and Bennett H. Mrs. Start deceased July 12, 1890. Source: Jacob G. Ullery, compiler, Men of Vermont: An Illustrated Biographical History of Vermonters and Sons of Vermont, (Transcript Publishing Company, Brattleboro, VT, 1894), Part II, pp. 373. He was Associate Justice of Vermont Supreme Court Since 1890. Henry R. Start, associate justice of the Vermont supreme court since 1890, died at his home at Bakersfield, Vt. last night at the age of 60. Judge Start was born in Bakersfield, December 28, 1845, the son of Simeon Gould and Mary Sophia Barnes Start. He and his brothers became prominent in Vermont and other states. One brother, Ozro G., was assistant judge of the Franklin county court. Another, Charles M., is now chief justice of the Minnesota supreme court. Henry Start was educated in the common schools and in Bakersfield and Barre academies. 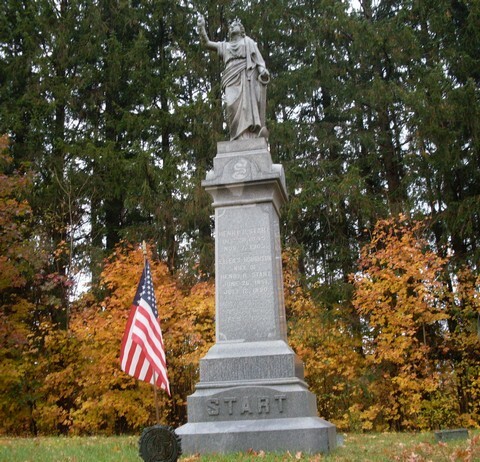 He was a veteran of the civil war, having served with Co. A, 3d Vermont volunteers. After the war he studied law, and was admitted to the Franklin county bar in 1867, beginning practice in his home town at once. He was state attorney for Franklin county from1876 to 1878, after which he formed a law partnership with A. P. Cross of St. Albans. Judge Start conducted the trials of the firm's cases, experience which later was of great value to him as presiding judge. In1880 he was elected state senator, and from1880 to 1888 he was one of the trustees of the Vermont reform school. In 1888 he was one of the presidential electors who cast Vermont's vote for Harrison and Morton. In 1890 he was elected state representative, and was chosen speaker. At the close of the first session he was made fifth assistant judge of the supreme court. Judge Start married in 1869 Ellen S. Houghton, who died in 1890.